Goodyear is the number one tyre manufacturer in North America and also Europe’s second largest manufacturer of tyres. Goodyear prides itself on its ability developing cutting edge new tyre technologies that suit the needs of today’s demanding drivers. The company was founded in the late 19th century with a handful of workers. Today Goodyear produces tyres all over the world which deliver outstanding performance and durability – and that keep you safer while saving you money on fuel. RunOnFlat. These are self-supporting tyres that can keep on going even after a blowout. ActiveCornerGrip and ActiveBraking – two technologies that deliver improved braking and cornering. SmartWear technology – a way to manage tyre wear, so they continuously resist aquaplaning throughout the tyre’s entire life. Goodyear’s commitment to innovation is second to none, and it has seen the company work closely with the European Union to develop the EU tyre regulation label. 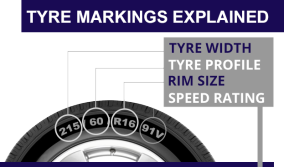 This label allows drivers to make a more informed choice when they buy new tyres. Car Clinic MOT Centre stock a wide range of Goodyear tyres including summer tyres, winter tyres, run flat tyres and tyres suitable for fitting to cars, vans, SUVs and 4x4s. For a free Ellesmere Port car repairs quote or Ellesmere Port tyres quote just give Car Clinic MOT Centre a call on 0151 3390101 or pop in at your convenience.